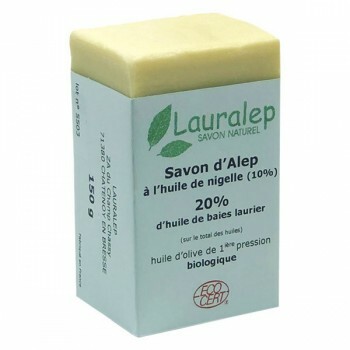 Discover the secret of Egypt’s most beautiful queens with Lauralep’s black seed oil Aleppo soap. This natural soap is rich in nigella oil (also known as black seed oil), which has been used for 4000 years to revitalise skin. Thanks to its gentleness, Lauralep Aleppo soap with black seed oil can even be used on sensitive skin as part of a daily skincare regime or before shaving to reduce the feeling of tightness. To use, rub the bar between wet palms to produce a foam and massage into the face and body before rinsing. For best results, use morning and night. Benefit from a truly revitalised complexion by combining with the Hemani exfoliating scrub with nigella seeds. 99,5% of the ingredients are from natural origin.